Mazinger Z is a gigantic Super Robot, constructed with a fictitious metal called Chogokin Z (in the American translation, Super-Alloy Z), which is forged from a new element mined from a reservoir found only in the sediment of Japan's Mt. Fuji. The mecha was built by Professor Juzo Kabuto as a secret weapon against the forces of evil, represented in the series by the Mechanical Beasts (mecha used for evil purposes) of Dr. Hell. The latter was the German member of a Japanese archeological team, which discovered ruins of a lost pre-Grecian civilization on an island named Bardos; the civilization was loosely based on the ancient Mycenae, and was called the Mycene Empire in the series. One of their findings was that the Mycene used an army of steel titans about 60 to 65 feet in height (compare with the Greek legend of Talos). Finding prototypes of those titans underground which could be remote-controlled and realizing their immense power on the battlefield, Dr. Hell goes insane and has all the other scientists of his research team killed. Except for Professor Kabuto; the lone survivor manages to escape back to Japan, and attempts to warn the world of its imminent danger. Meanwhile, Dr. Hell establishes his headquarters on a mobile island which he sails around on, and plans to use the Mechanical Beasts to become the new ruler of the world. To counter this, Kabuto constructs Mazinger Z and manages to finish it just before being killed by a bomb planted by Hell’s right-hand man, Baron Ashura. As he is dying, he manages to inform his grandson Kouji Kabuto about the robot and its use. Kouji becomes the robot’s pilot, and from that point on battles both the continuous mechanical monsters, and the sinister henchmen sent by Doctor Hell in every episode. 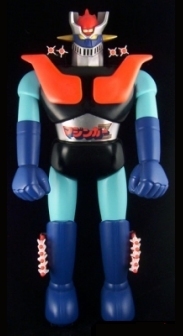 Mazinga-Z was the first Jumbo Machinder released by Popy and its popularity led the way to the creation of all the other Jumbos to follow.